The B 790 PLUS is enriched with exciting NEW embroidery features like Pinpoint Placement, Enhanced Editing Functions, Total Embroidery Stitch Control and much more. The B 790 PLUS offers a full 13-inch extended free arm including ten inches of space to the right of the needle. Enjoy a large sewing and embroidery area. 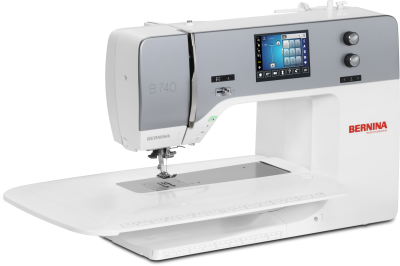 The BERNINA 790 PLUS meets all your sewing and embroidery requirements. Equipped with the embroidery module and the Stitch Designer function, it offers new creative possibilities. The BERNINA hook with a stitch width of 9mm ensures the highest stitch quality. The heart of the BERNINA 7 Series features a novel, centrally placed driver, which allows the BERNINA Hook to run fast yet quietly. The BERNINA Hook sews high-precision stitches up to 9 mm in width with speeds up to 1,000 stitches per minute. The bobbin holds up to 70% more thread than standard bobbins allowing you to sew longer without interruption. The BERNINA 7 Series includes a meticulously engineered extended free arm with 10 inches of space to the right of the needle. Not only does the BERNINA 790 PLUS provides you with ample space for big, beautiful sewing and embroidery projects, with its 9mm stitch width, it is also ideally suited for decorative stitches. The extra-large embroidery module lets you stitch out maxi-sized motifs. And should your ambitions grow the B 790 PLUS can be updated with a wealth of accessories. The BERNINA Adaptive Thread Tension, a BERNINA innovation, provides ideal thread tension for each and every stitch type, in any variation. The tension is electronically adjusted to the selected stitch width, length, speed, and needle position on each penetration of the needle into the fabric. The result is the finest stitching without pressing a button. The BERNINA 790 PLUS is equipped with the BSR function. The BSR foot assists you with free-motion sewing and quilting with a straight or zigzag stitch, ensuring stitches of the exact same length even at variable sewing speeds. It comes standard with the machine. The BERNINA 790 PLUS is our embroidery expert. Switch to embroidery mode directly via the touchscreen. Embroidery mode lets you easily position, mirror, rotate and resize motifs. Design editing on the B 790 PLUS offers a wealth of additional options, letting you create curved lettering effects, alter stitch density, and combine decorative stitches or alphabets with embroidery designs. Complex combinations can even be re-sequenced according to color, and alternative color options can be reviewed before stitching out. The Check function lets you position the design precisely before embroidering. The finished design can be saved directly on the machine or on a USB stick. The embroidery module comes standard with the machine. The BERNINA 770QE provides maximum quilting comfort. With stitch width of 9mm, the BERNINA Stitch Regulator, the BERNINA Dual Feed and an extra long free-arm, it is possible to master even large sewing and quilting projects. 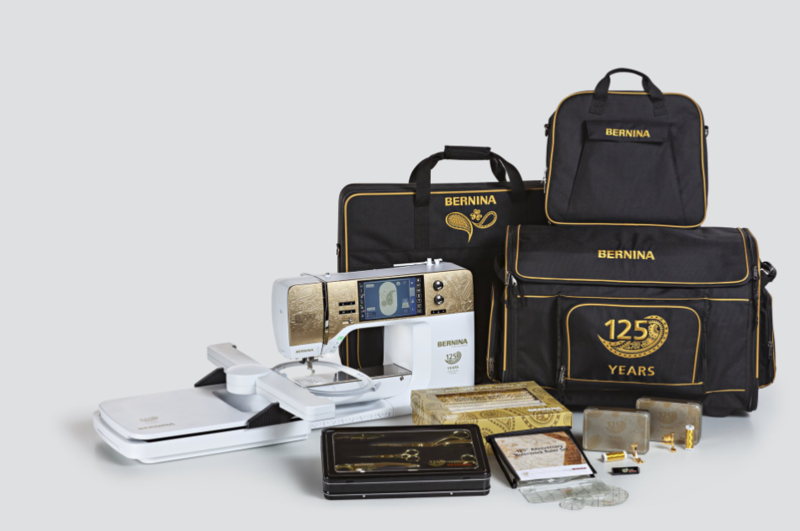 Embroidery capabilities are an option for the Bernina 770QE. The BERNINA 770 QE also includes the Patchwork foot 97D with a movable guide rail. For patchworking, it provides extra reliability for when joining together the patchwork pieces. When used in conjunction with the straight stitch needle place, it enables you to achieve a perfect stitch result. The BERNINA 770 QE is equipped with the BSR function. The BSR foot assists you with free-motion sewing and quilting with a straight or zigzag stitch, ensuring stitches of the exact same length even at variable sewing speeds. It comes standard with the machine. The innovative BERNINA Dual Feed tames hard-to-manage fabrics providing superb fabric feed and optimum visibility while sewing. Easy to engage when needed, the BERNINA Dual Feed tucks completely out of the way when it’s not. The BERNINA 7 Series includes a meticulously engineered extended free arm with 10 inches of space to the right of the needle. Not only does the B 740 provide plenty of room for large sewing projects; with its 9mm stitch width, it’s also ideally suited for beautiful decorative stitching. Small sewing jobs such as inserting zippers are completed flawlessly. And as your ambitions grow, the B 740 can be further upgraded with a wealth of optional accessories. For instance, add the BERNINA Stitch Regulator (BSR), which guarantees consistent stitches when free-motion sewing and quilting no matter how quickly you move the fabric. All BERNINA 7 Series models provide an exclusive level of stitch control. Whether altering the stitch length, stitch width or needle position, the machine will remember the stitch details for you. Your personal settings can be saved and retrieved at will—and the USB connection even allows you to import and export stitches and stitch patterns or combinations. The innovative BERNINA Dual Feed tames hard-to-manage fabrics providing superb fabric feed and optimum visibility while sewing. Easy to engage when needed, the BERNINA Dual Feed tucks completely out of the way when it’s not. The BERNINA 7 Series includes a meticulously engineered extended free arm with 10 inches of space to the right of the needle. The BERNINA 700 features an extra-large embroidery area for large designs (up to 400 x 210 mm). Three embroidery hoops included and you can choose from a large range of optional embroidery accessories and software. 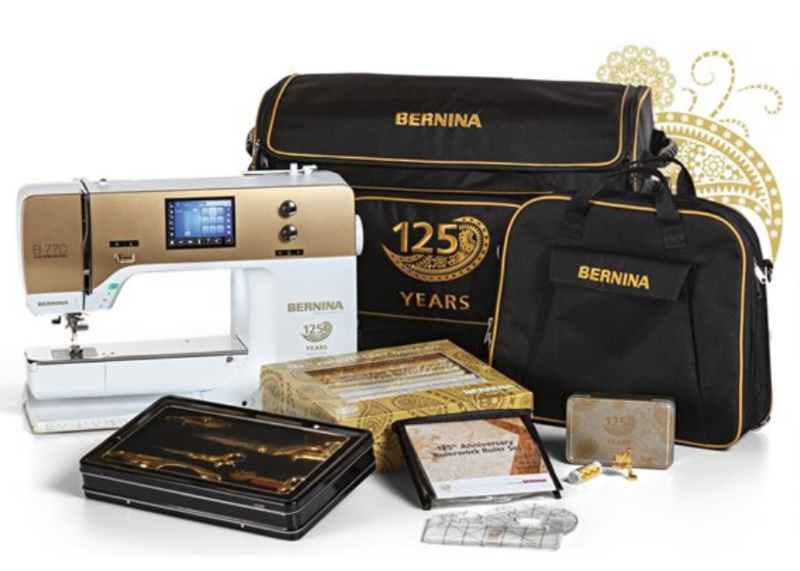 The BERNINA 700 is an Embroidery Only Machine – no sewing functionality. An exciting new feature exclusive to the BERNINA 700 is Pinpoint Placement for accurate design positioning. Simple to use: Select two points on the screen and match them with the markings on the hooped fabric, Align, rotate or resize your design to fit as desired. No additional tools or aids needed. Another exclusive feature is the Thread-up Command to lower and raise the needle bringing the bobbin thread to the top of the fabric at the start of stitching leaving the underneath side of an embroidery project beautiful and clean. Choose from 320 embroidery designs, 18 embroidery fonts and 1 large monogram set – all built-in.